Why did Congress write the Inspector General Act of 1978? Enacted 40 years ago, the federal law established an independent arm within federal agencies to conduct audits and investigations to prevent and detect fraud and abuse. The inspectors general are tasked with a mission to promote "economy, efficiency and effectiveness" and to inform Congress about problems in the administration of government programs and services. The size and scope of the executive branch spans across a sprawling federal bureaucracy that administers the lion's share of the federal government's $4 trillion budget. That's an awful lot of tax dollars to account for, particularly since wrongdoers belly-up to the federal trough any chance they get. That's why our system of checks and balances is so vital. The size of the executive branch is far bigger than the legislative branch. A few years ago, one study estimated the executive branch in one way or another employs nine million people. Congress has 535 members. Even if I had eyes in the back of my head, I wouldn't be able to scrutinize every nook and cranny of the federal bureaucracy single-handedly. The 1978 law added a key tool to help Congress perform oversight duties of the executive branch, a job the Supreme Court has recognized is fundamental to our system of checks and balances. The Inspector General Act serves as an arsenal for accountability within the executive branch. Specifically, inspectors general have resources and authorities designed to keep federal agencies honest and on their toes, including criminal investigators, auditors and forensics capabilities. The Offices of Inspectors General (IG) are designed to stay immune from the bureaucratic hierarchy and partisan influence. And yet, too frequently, federal agencies have an allergic reaction to independent review, and stymie efforts to provide information and access to agency records. To prevent embarrassing or fraudulent information from seeing the light of day, an agency under investigation will embark on a bewildering effort to deny records, resulting in wasteful delays to undermine the IG. So, Congress wrote and passed a new law to say we meant what we said the first time: IGs are entitled to "all records" to conduct their work. As an outspoken supporter for whistleblowers, I've also worked to empower the brave souls who come forward to report wrongdoing so that they understand their rights. Congress also requires each IG to have a "whistleblower ombudsman" who works on their behalf to make sure they understand laws that protect them from retaliation for reporting waste, fraud and abuse. Just this summer, the president signed into law new measures that put even more teeth into the ombudsman responsibilities to improve protection programs for wistleblowers across the federal government. With national security at stake and $4 trillion flowing from federal coffers, we can't afford to mute the voices of those who witness misconduct while working in the trenches of the federal bureaucracy. Without a doubt, I will keep turning up the volume on government accountability. 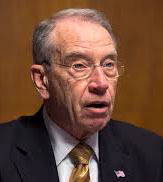 From: Senator Chuck Grassley, News Release, July 13, 2018, https://medium.com/@ChuckGrassley/q-a-inspector-general-act-2c108fdc2802, accessed 07/16/2018. Reprinted in accordance with the "fair use" provision of Title 17 U.S.C. § 107 for a non-profit educational purpose.